Yep, anything that goes with denim has always been a perfect piece. Pair it with black, white, red, you name it, denim goes with anything perfectly. So what if denim paired with denim? Hmm.. You may have seen many bloggers wear their "denim on denim", and so do I.
Ok, let me tell you that I'm obsessed with my bell-bottoms so badly, and I thought it would be a great piece when I pair it with my slightly-oversized denim. And, of course, finished off with a delicate wrap choker! 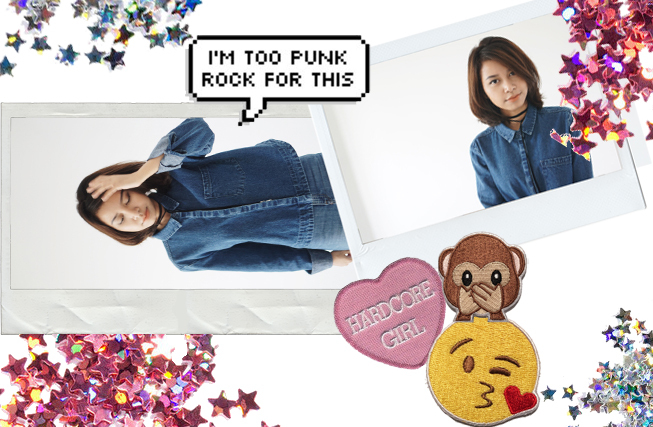 I love how you've paired this double denim look with that choker- super 90s vibes and I love it! oooo I'm loving this double denim look, and your haircut is just perfect! Love love love your look dear... nice denim on denim!